As many of my readers know, I am a big fanatic of cemeteries. I am interested in not just walking through them but also consuming any news relating to them. Over the past several weeks, I have experienced a new cemetery and also read a couple local stories about events taking place at graveyards as well. For tonight’s post I want to update you regarding my ongoing cemetery education. Marion Cemetery: The day after Halloween, I went with Sidney and her parents to their hometown of Marion, South Carolina. We attended the Sunday service at the First United Methodist Church where they honored all members of the congregation who passed away during the year. Sid’s grandma, Sis, died in June and a candle was lit for her on that All Saints’ Day morning. After the service concluded, we drove to Rose Hill Cemetery in Marion to view Sis’ final resting spot as well as other members of the Mathis family. It was an organized, quiet area. The history inside the cemetery was great. Many of the departed lived during the 1800’s. 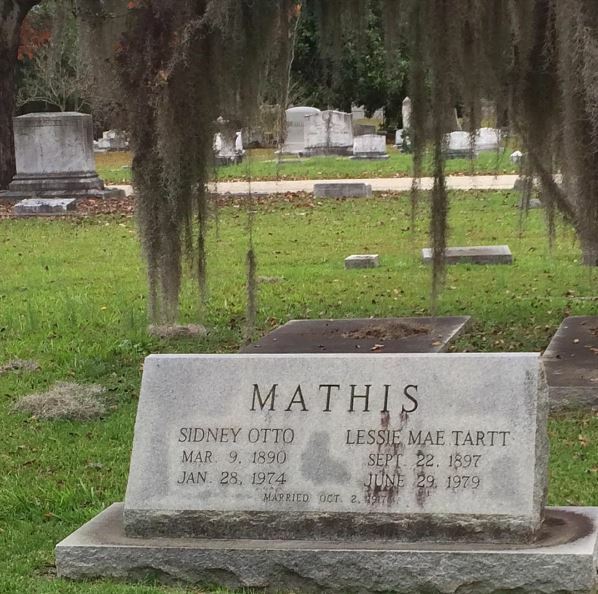 After paying our respects at the grandma’s grave (she is buried with her husband), we drove around for a couple minutes and I got to see the grave of Sidney Mathis Jr. (My fiancé is Sidney Mathis IV, my future father-in-law is Sidney Mathis III). Going to the service and visiting the cemetery was a great way to spend the Sunday morning. I snapped this photo of the tombstone of Sid’s great grandparents. 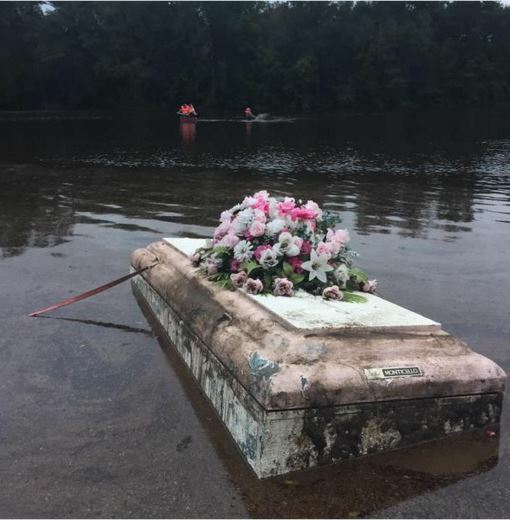 Caskets Unearthed: As most of you know, South Carolina experienced terrible flooding this past month. While the non-stop rain impacted many of us still living, it also sadly impacted some of the dead. Two towns in our state, Springfield and Ridgeville, had their cemeteries greatly disturbed by the flooding. Caskets at both locations rose up from the ground. What a grim occurrence for families who had loved ones in those spots. Nothing was harder to watch though than television footage of the coffins floating in the flood waters, drifting further and further away from the graves. I never saw a follow up story but I sure hope all caskets were retrieved and laid back to rest. So unfortunate. This was one of the caskets in Ridgeville that was unearthed (Photo courtesy of WCBD-TV). Putting the Forgotten to Rest: This morning, I read a Sun News article about something called a paupers’ cemetery. For how much I claim to love graveyards, I had not heard about one of these until today. A pauper’s cemetery is a place where unclaimed remains, unknown remains, and the remains of those who don’t have families who can afford a burial are laid to rest. This particular pauper’s cemetery I read about is in Columbia. The article chronicled the burial ceremony the coroner’s office holds a few times each year. At each one of these burials, the cremated remains of around 30 people are laid to rest. It is a very solemn, simple proceeding. Remains are put in what is analogous to a shoe box and placed in a shallow hole. 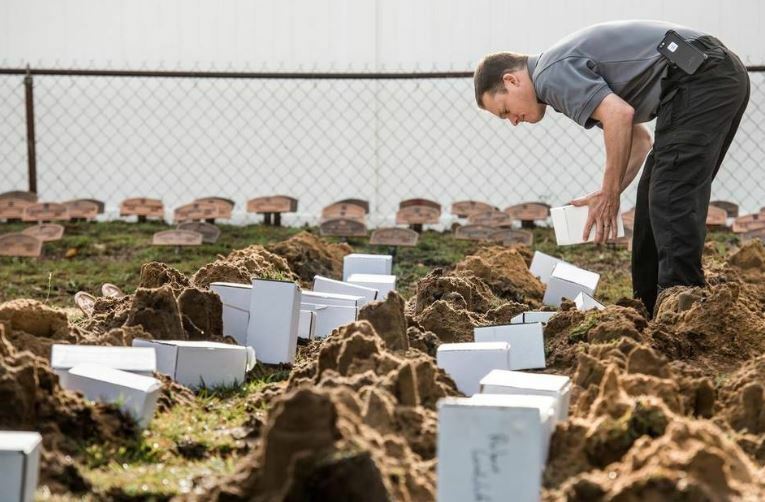 Dirt is shoveled on the box and a tiny rust-colored marker is placed on each grave. It all just feels so depressing to me. However, I have to tell myself that at least something is being done with the remains of these downtrodden people. While I do love cemeteries, I don’t know if I would want to visit one of these. A photo of the paupers’ cemetery in Columbia, S.C. (Photo courtesy of the Sun News). I want to keep exploring and educating myself about cemeteries. As always, if you have any tips for me on where I should visit or what I should read, please let me know. Hope the week is off to a great start for everyone. Don’t Blink. This entry was posted in Uncategorized and tagged caskets unearthed, paupers' cemetery in Columbia, Ridgeville Cemetery, Rose Hill Cemetery, Sidney Mathis by brent. Bookmark the permalink. You need to have Doug take you on a tour of the Kingston Lake cemetery in Conway. It’s a beautiful location you would never find on your own. Doug can tell you the history of many buried there. Hello Brent. Imagine our surprise coming across this archive post about the Mathis family from Marion, SC. My wife is Anne Tartt Barham. She is the daughter of James Raynor Barham Jr. the son of Eva Bethenia Tartt who was Lessie Mae Tartt’s sister. My wife recognized all the names of the folks in your blog post. Best wishes to you and yours this Christmas and especially the not too far away arrival of your baby girl. Thank you for posting on the Pauper Cemetery in Columbia, SC. For 14 months I have been looking a Vietnam Veteran with no next of kin. I was told that his cremains were sent from Berkeley County to Columbia for Burial. Even though he was a Veteran he did not receive a Veteran Burial. Since he had no next of kin, nobody could claim his ashes. I am waiting to find what cemetery buries the indigent/no next of kin in SC. This Veteran had exposure to Agent Orange. Please, if you could tell me the name of this cemetery and where it is located, his childhood friends in Pennsylvania would be ever in your debt. Some of them have been searching for him for 15 years. Hi Diane – Good evening. Thanks for reading my blog. Unfortunately, all I know about that cemetery is what I have linked to in the post.